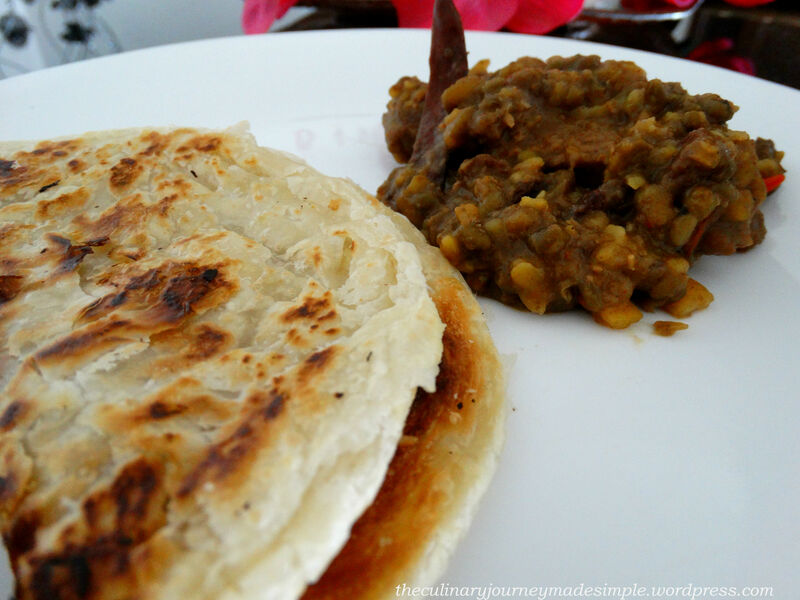 Here is one of the best recipes I’ve prepared till date! Mutton has been my favorite meat all along. 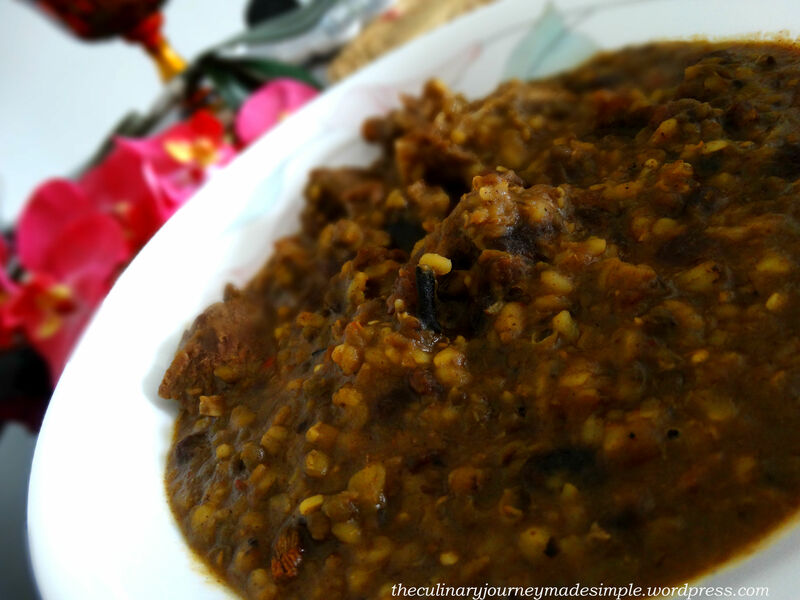 In fact, I can have a mutton dish at least once, every single day! But in reality I try to restrict it to once a week or once in two weeks for health reasons of course, and most of the times I have it outside since it takes a while to prepare at home. However, this time I was in no mood of having the same old mutton curry! Suddenly it struck me…. 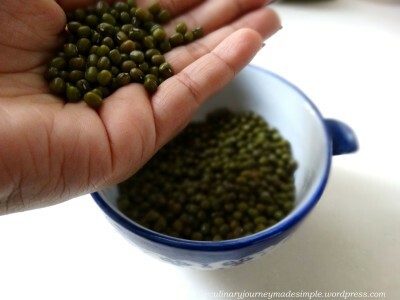 why not cook it with lentils? The thought itself made me excited! 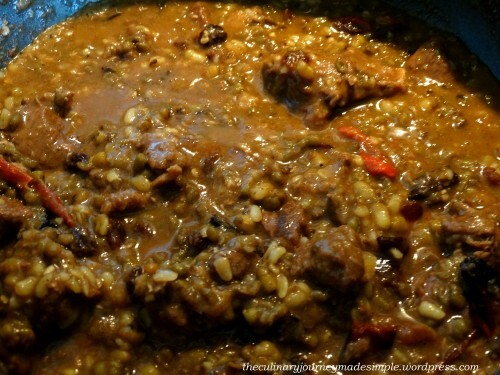 I had seen some middle eastern recipes in some cook books (can’t recall the name of the books) before where meat is cooked with lentils but I couldn’t remember the exact recipe. So I prepared the dish in my style. I used clarified butter (ghee) in this recipe. It gave an amazing flavor to the dish, but I tried to use as little as possible to keep it gentle on the stomach. 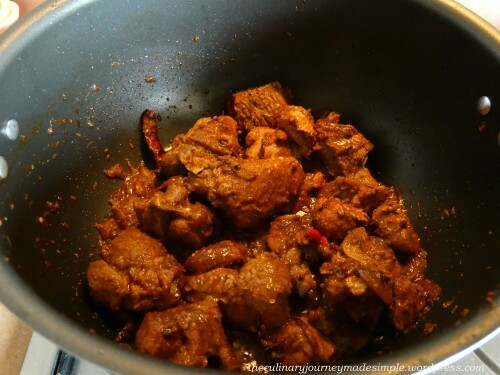 Step 1: Add some grated ginger and diet coke to the mutton and marinate it for 30 to 40 minutes. This will make the mutton soft. Once marinated, drain the diet coke and ginger and wash the mutton properly. 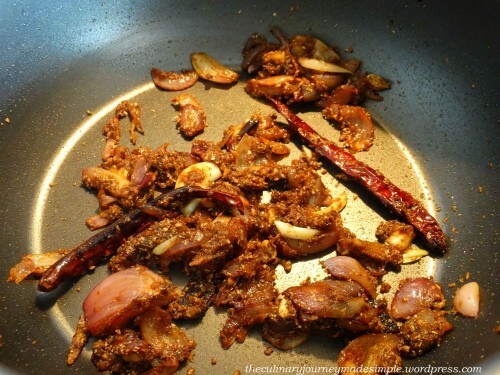 You can use other methods to soften the mutton as well (as per your preference). 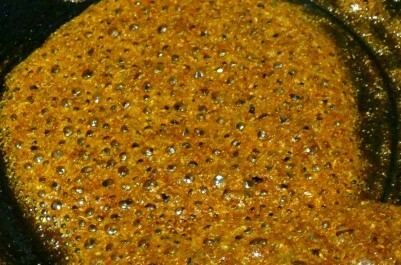 Step 2: Heat the oil and clarified butter (ghee) in a U-shaped vessel or pan. 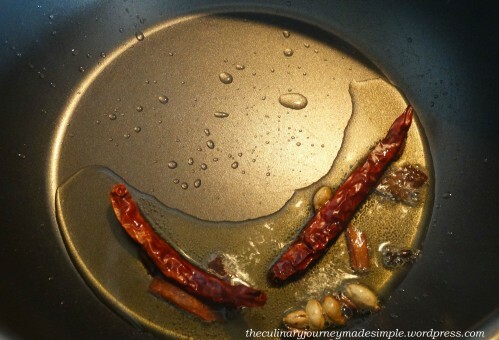 Add the dried red chili, cardamom seeds, cloves and cinnamon sticks. 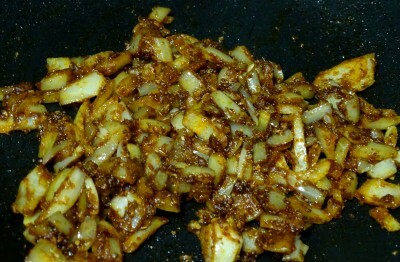 Once they splutter, add the onions and paprika and cook for 2 minutes. 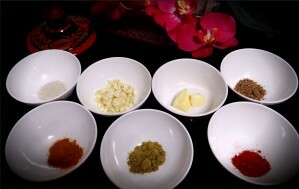 Step 3: Add the ginger garlic paste, followed by the cumin and coriander powder. 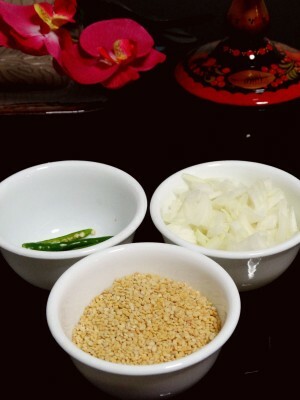 Mix well and cook for 2 to 3 minutes. Step 4: Add the mutton. 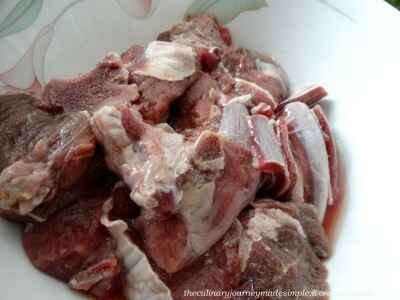 Mix it well with all the other ingredients and let it cook for few minutes until the color of the meat has changed. Now add around 2 cups of water, lower the heat and cover the pan. Let the mutton cook slowly in low heat. You will need to let it cook for around 45 minutes to 1 hour until the mutton is soft. 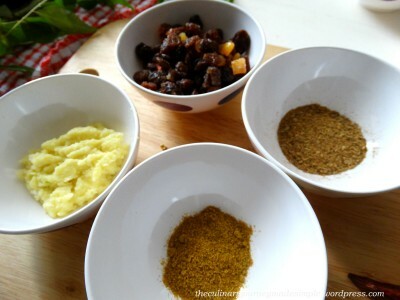 Stir the mixture at 15-20 minutes intervals. If the water has almost evaporated and the mutton isn’t cooked yet, add a little more and cover again. 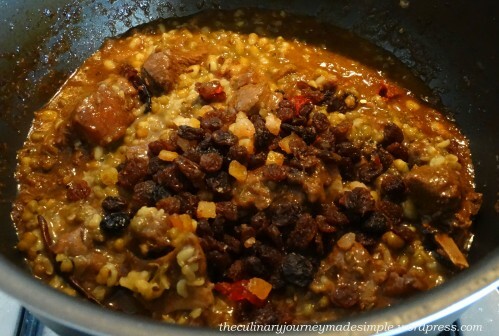 Step 5: Once the mutton is soft, add the dry fruit mixture and the boiled lentils. Stir to mix well and cook for another 3 to 5 minutes. Add salt for taste. Once you have the desired consistency, transfer to a serving bowl. Step 6: Serve hot with rice or bread of your choice. If you don’t have much time, you can use a pressure cooker to cook the above recipe. After Step 4, cover the cooker and let it cook until 8 to 10 whistles approximately. You can open the cooker after that (make sure you eject the steam) and then follow from Step 5. Feel free to use the meat of your choice as per your preference. 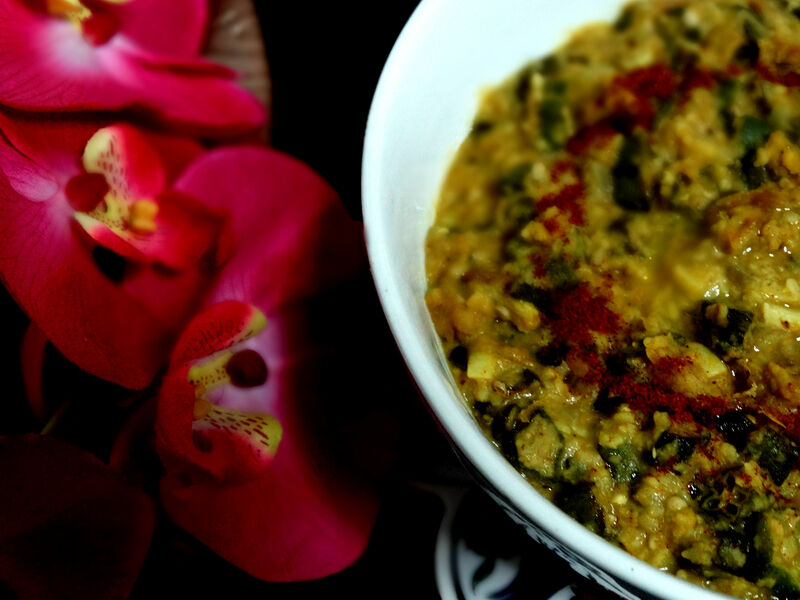 Lentil soup has been kind of a staple diet since childhood. 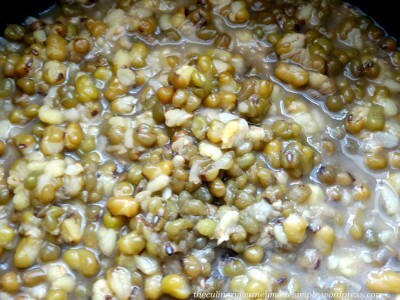 My mom used to prepare lentil soup everyday, along with other dishes. It was kind of compulsory to finish it and to be honest sometimes I hated it! It’s not that I hated the dish itself, in fact I liked it, but this everyday routine had probably made it boring! 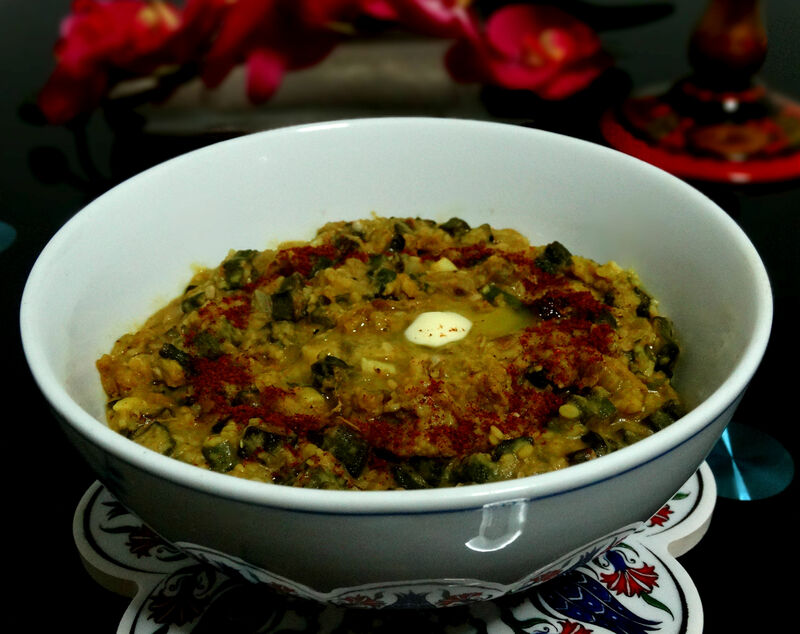 But after I left my hometown, I used to miss the dish and it was then that I learnt how to make a simple lentil soup. It never turned out as tasty as mom’s, but I was quite happy with it back then 🙂 I’ve been making the soup every now and then at home here in Singapore, but the simple soup recipe became kind of monotonous again! I was thinking the other day how I could twist the recipe to make it a little interesting while still keeping it healthy. 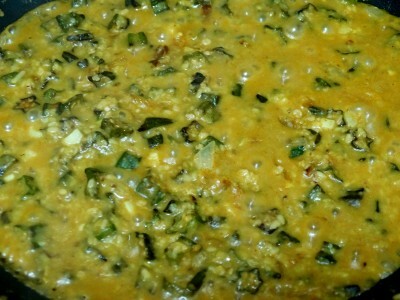 So I cooked the lentil soup into a thick consistency and tossed in some stir fried lady’s fingers (okra) into the mix. I loved the color of the dish too… yellow with some green and garnished it with some red… perfect!!! 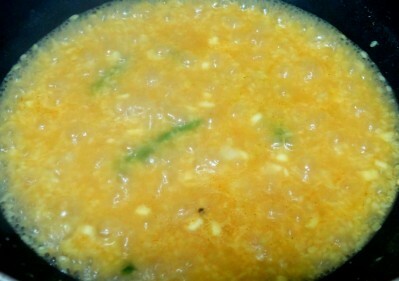 Yellow lentil (moong dal) – around 1/2 cup, boiled in 3 cups of water. Do not drain the excess water after boiling. Step 1: Heat 3 tablespoons of oil a U-shaped pan. 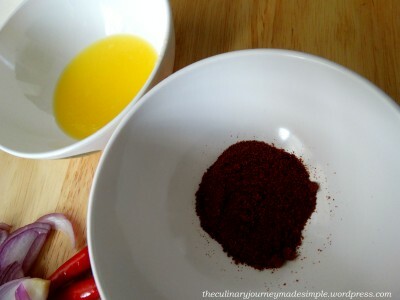 Add the turmeric powder, coriander powder, asafoetida powder (heeng) and cumin powder. Stir for few seconds. 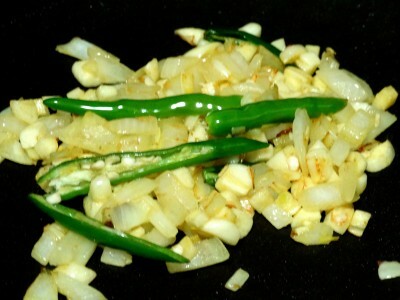 Step 2: Add 2/3rd of the chopped onion and cook for 2-3 minutes or until they are lightly browned. 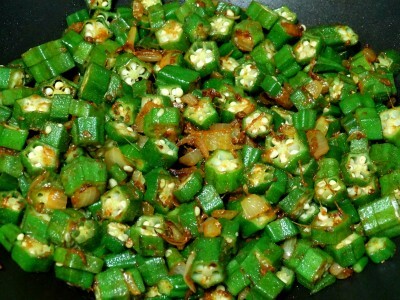 Add the lady’s finger (okra) and cook for around 8 minutes until they are soft and almost cooked. 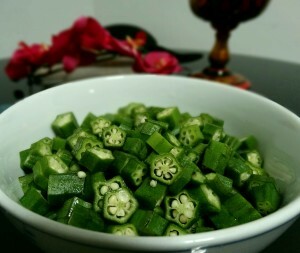 Make sure you stir every 30-40 seconds, else the lady finger (okra) may burn easily. Add salt for taste. Transfer to a dish and keep aside. 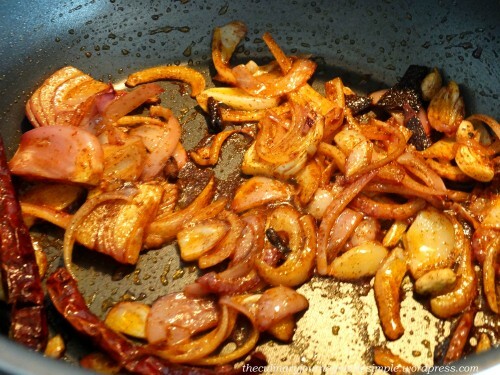 Step 3: Add the remaining 1/2 tablespoon of oil to the pan and the remaining chopped onion. 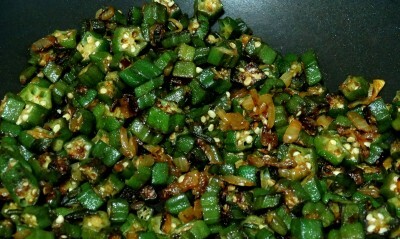 Add the garlic and green chili and cook for 1-2 minutes. Step 4: Add the lentils (with the water) and let it cook for a minute. Step 5: Add the fried lady’s finger and mix well. Let it cook until you have a very thick consistency. Check salt for taste. Step 6: Transfer to a serving bowl. Add a dollop of butter at the center and sprinkle some paprika to garnish. 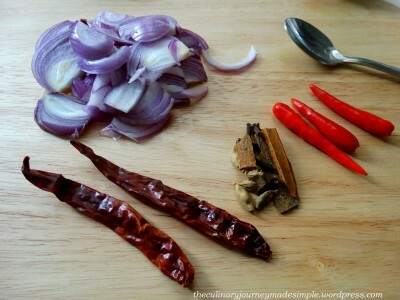 Serve hot with bread or rice.